Marie Antoinette (1755 – 1793) Austrian born-French Queen, executed during the French revolution. Marie Antoinette was born in Austria and, at a young age, married to King Louis XVI of France. She came to symbolise the privilege and power of the French Monarchy and by the time of the French Revolution she had become a hate symbol for those wishing to overthrow the privilege of the French aristocracy. In 1793, she was sent to the guillotine and executed by the Revolutionary authorities. Marie Antoinette was born in Vienna, Austria in 1755. Her father was Francis I, the Holy Roman Emperor. Her mother was Maria Theresa the ruler of the Habsburg Empire. Together they formed the Habsburg-Lorraine dynasty. Marie’s early life was relatively happy. Court life in Vienna was relaxed; she mingled with many children, including commoners. Her formal education was limited, instead, she was taught the essentials of courtly life, such as dress, appearance and the correct behaviour of a lady. Many remarked the young Marie had exquisite poise and a graceful deportment. To cement an alliance between the Habsburgs and France, her family arranged a marriage between Marie Antoinette and the future King of France – Louis XVI. Marie was married aged just 15, having never met her future husband. The lavish marriage ceremony took place in Versailles with over 5,000 guests. Many people were impressed by Marie’s physical beauty and deportment; she charmed many people. But, it was a difficult transition for Marie. Aged just 15, she was thrust into the French court with few friends and little knowledge of French life. She had a difficult relationship with Louis XVI; the two spent much time apart. Louis appeared to have little interest in sleeping with his wife; he was more interested in outdoor pursuits, metalwork and was considered to have a streak of immaturity. Marie Antoinette had the added difficulty of being Austrian; many in the French court were suspicious because of her foreign roots. Amongst her many names included “l’Autrichienne”, the “Austrian woman.” This tended to make court gossips less sympathetic, and it wasn’t long before unfriendly and malicious gossip began being spread among the court and Paris society. Queen Marie Antoinette of France and two of her Children. Adolf U. Wertmüller 1785. With few official duties, Marie Antoinette spent her days socialising in the palatial surroundings of Versailles. She came to develop extravagant and indulgent tastes. It was expected that as French Queen she would lead fashion and spend the most on clothes. But, in addition to her dress, she also spent increasing amounts of money on gambling. On one occasion, she spent three solid days gambling with friends up to her 21st birthday. Her behaviour was reported to her mother, Maria Theresa – who sent a strong letter of admonishment to her daughter, telling her to mend her ways. Whilst Marie enjoyed a life of pleasure and indulgence at court, French society was beginning to strain under the pressure of debt and economic stagnation. French society was deeply unequal with many people struggling to afford enough food. The contrast between monarchial privilege and life for peasants was stark, and this discontent grew into greater political pressure for reform. She became referred to as ‘Madame Deficit’ for her lavish spending. She spent much money on refurbishing the Palace of Versailles, including the Petit Trianon – a small chateau within the grounds of Versailles. Although it had been built for the previous King’s mistress, the fantasy chateaux became associated with Marie – and how out of touch with reality the Monarchy was. To appease this social division, Louis XVI proposed reforms to end the worst excesses of privilege and also to impose a more progressive taxation system. However, his reforms were blocked by the nobility and clergymen who vetoed proposals to increase taxes on the rich. Looking for a scapegoat, the French press blamed ‘Madame Veto’. It is uncertain whether Marie Antoinette actually vetoed the proposals, she may well have supported her husband and tended not to take much part in political affairs. If she did veto the proposals, she was one of many aristocratic people to defend their privilege. However, the foreign-born Marie made her an easy target. It didn’t help that her marriage was increasingly unworkable. Spending little time with her husband, but in revelry, gossip began to spread that she was having affairs with court nobles. Amongst many names, she was referred to as the “Austrian Whore” This is likely to be unfair. Although she had a decadent lifestyle, she was not promiscuous; it is widely considered that she only really had one lover – the Swedish military attaché Count Axel Fersen, and this was probably with the tacit approval of Louis XVI. Louis was reluctant for many years to sleep with his wife, causing great concern over the lack of an heir to the throne. In 1778, Marie finally became pregnant after her marriage was finally consummated. She had a baby daughter after a difficult birth. Three years later, in 1781, she gave birth to Louis Joseph Xavier François, who bore the title Dauphin of France. It was a moment of great relief for both the King and Queen. In 1785, she gave birth to a second son, Louis Charles. But, despite providing two male heirs, her popularity continued to fall. Some whispered that her second son was illegitimate – his birth coinciding with a visit from a suspected lover nine months previously. Also, her purchase of Chateau de Saint-Cloud was widely criticised for its cost – at a time of great debt and poverty within France. Deteriorating economic conditions caused a popular uprising. In October 1789, a mob entered Versailles and the Royal Family were imprisoned in the Tuileries. This led to the formation of the National Assembly – placing power in the hands of the French people and expressing high ideals of liberty, egalite and fraternity. It was a shock for the whole of Europe. The privilege of centuries was being swept away. Rightly or wrongly, Marie came to symbolise the decadence of aristocratic privilege. In June 1791, they attempted to escape – Louis XVI and Marie headed for the Austrian border. This attempted flight from France made many fear that the Royal family were no longer loyal to the French government; it lost the Royal family even more popular support; some feared that Marie was seeking an alliance with the Austrian army. In 1792, to test the Royal Family’s loyalty, France declared war on Austria. The French army was defeated and Marie became a convenient scapegoat. The family were imprisoned at the Temple Prison from September 1792. In July 1793, her son was taken away, and in October, she was convicted of treason and executed by the guillotine. On the eve of her execution, Marie Antoinette displayed a courage and steadfastness which belied her popular image. She wrote to her sister-in-law, encouraging her to forgive young Louis for his accusations in court and to ask him not to seek revenge. She said she was as calm “as people are whose conscience is clear.” On the morning of the execution, a priest counselled courage as she was prepared for execution. She replied. Marie Antoinette was 37 years old when she was executed. Amongst the propaganda and pamphlets, it becomes hard to separate her public image from her actual beliefs and behaviour. Like many aristocratic nobles, she enjoyed tremendous privilege and her life at Versailles was decadent, especially when compared to the dire poverty of most people. But, she became a pawn in a propaganda war and her public image became subject to all kinds of projection and libel. The true Marie Antoinette is always difficult to decipher – not least because writers can rarely agree. An apocryphal story during the French revolution is attributed to Marie Antoinette. There is no evidence she actually said this. In Jean Jacques Rousseau’s Confessions(1766) he does write of a fatuous noblewoman who makes this statement. It is likely that she was attributed this statement out of libel and desire to make her a scapegoat. 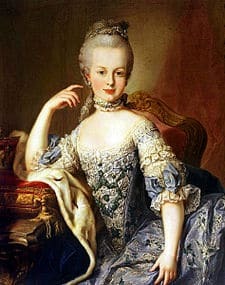 Marie Antoinette was just a teenager when she was thrust into one of the most important positions in European society. She enjoyed the social whirl and privilege life afforded her. She expressed little if any sympathy for democratic ideals or social change. But, she was not alone among aristocrats for enjoying the pleasures of economic privilege. Her perceived extravagant lifestyle made her an ideal target for cartoonists keen to strengthen public opinion against the monarchy. Thomas Jefferson went as far to say that if Marie Antoinette had been cloistered in a convent, the French revolution would never have happened. Others contend she was largely a frivolous person, thrust into the limelight, but having little bearing on political life. The truth is perhaps somewhere in between.